Sharks are ancient fish that live in the ocean. Lots of people are scared of seeing them in the sea. They eat other fish, but they don't ever hunt humans. Sharks have a very sand-papery texture. 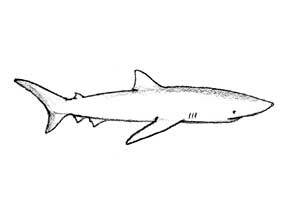 Shark bones are made from cartilage, which is that bendy stuff in our ears. Their teeth are extremely sharp and last for a lifetime. When they fall out, new ones quickly grow in their place. Every year humans kill 100 million sharks, just for their fins. 273.973 sharks are killed every day. Shark -finning is cruel and wasteful, but is legal in New Zealand. You can catch a shark, cut off its fins, and dump it in the water and not get in trouble at all! The shark is supposed to be dead, but sometimes it is still alive when it is thrown back in. Other countries have banned shark finning, but not New Zealand. Shark fins are worth a lot of money- that's one reason people actually do shark finning. I wrote to David Carter MP to ask him to do something about shark finning. Please could you write too. If you like you can copy my letter below. I also drew lots of colourful fish and seaweed around the words which was quite fun. Why do you think it is legal in NZ to cut off the fins from sharks? I know you are busy, but this is crazy! It is cruel to let this happen in our waters. Shark finning is already illegal in 98 countries. It is not fair, and it’s endangering the food chain in our oceans. I love New Zealand, and I feel really strongly about shark finning. Awesome blog Keira. I didn't even know you had a blog! And it's great what you are doing for the sharks. Save the Sharks! I'm gonna send the letter in. Thanks for making it so easy. I'll tell Iris you've got a blog and she can send you a message too. Hope you are well.